VANCOUVER is more than just maple syrup and a fresh catch of salmon. The sixth most livable city in the world is actually smaller than Singapore, but thanks to its vast landscape seems a whole lot bigger. Once you’ve stepped off the plane at Vancouver International, you’ll be encountering a melting pot of cultures, thanks to its close proximity to the United States and attractive immigration packages. Depending on your cravings, you can have Canadian fare for lunch, and then the familiar flavours of Asia for dinner—the sushi joints in Vancouver are far superior to what we get in Singapore. Trust us. We’ve scoped out not only the tourist traps, but also the hidden gems that are all but a stone’s throw away. Whether you’re an avid hiker or just a simple sightseer, there’s something for you to do in this beautiful metropolis. The ideal time to take a long trip across the Pacific to Vancouver would be during the months of July to September. You might think that summer in a temperate country means blistering weather, but in actuality it never gets hotter than 25 degrees here, and that’s considered ‘hot’ in the city. A long-haul flight to Vancouver would almost always require a layover in one of the major Pacific Rim cities like Hong Kong, Tokyo, or Taipei. Singapore Airlines, Eva Air, and Cathay Pacific all regularly make shuttles to Vancouver International Airport. Remember to apply for an eTA (electronic Travel Authorization) before you depart Changi Airport, and once you’ve arrived, immigration and customs is a breeze to get through. After picking up your bags, you can either take the Canada Line to the metro part of Vancouver (20-25 minutes) or grab an taxi to your hotel in town (ride-sharing services are not allowed in British Columbia). If you are spending a few days in the city, we highly suggest renting a car. It would make your travel a lot smoother, even though public transport in Vancouver is extremely efficient. Having a car would also allow you to access the more hidden spots outside the metro area at your own pace. Following a rowdy tour group that rushes you from point to point is not how you would want to enjoy exploring the city. As one of the oldest neighbourhoods in Vancouver, Gastown holds the key to the heritage of the city. At the heart of this hipster-esque enclave is the steam clock, a landmark that has been attracting visitors since 1977. Every quarter hour, the clock will blow out some whistles as a little teaser for the tourists, before the big hourly melody chimes, so get your cameras ready to record the charming treat. Gastown is also famed for the many restaurants and bars that line the cobblestone streets. For lunch, we highly recommend grabbing a seat at The Flying Pig, a Vancouver institution. It’s best to dine there during the daytime as the dramatic floor-to-ceiling windows let in a ton of natural daylight, illuminating the cosy space as you’re served with delectable Canadian fare. Some items on the menu are seasonal, but a mainstay is the Salt Spring Island Mussels and Frites that would leave you wanting more. The broth for the mussels changes on a daily basis (we had the one with white wine and chives), and once you’re done feasting on the meat, you can ask your server for a bread basket to soak up the broth. After a hearty meal, you can take a leisurely stroll along either direction of Gastown. While there is no shortage of souvenir shops selling all types of Canadian memorabilia, you’d want to pop by John Fluevog, Six Hundred Four, and Kit and Ace. John Fluevog is a haven for shoe – not sneaker – lovers. The Canadian designer first started his namesake brand almost five decades ago, and his clientele since has included The Beach Boys, Alice Cooper, and Robert Altman. The signature Fluevogian shoe is the “Angel Sole” which has a cheeky inscription: resists alkali, water, acid, fatigue, and Satan. Over at Six Hundred Four (just right next to the steam clock), it’s a sneakerhead’s paradise. However, you won’t be copping any Off-White Nike’s or Guccis here. The brand partners with Vancouver-based artists every so often to release a collection of 604 sneakers in four designs based off an artwork. They come in various styles like a canvas slip-on or a full-leather high-cut sneaker. Each colourway averages at around 151 pairs, and is individually stenciled with a unique serial number. Knock yourself out in sneaker heaven. If you are regularly cycling on two wheels, then make sure to pop by Kit and Ace. This Canadian label was founded by the former lead designer of Lululemon, and they specialise in high-utility apparel while still maintaining the chic athleisure style. Think essential features like water-repellency, moisture-wicking, and discreet reflective surfaces. It’s not a trip to Vancouver without a stop at Stanley Park. 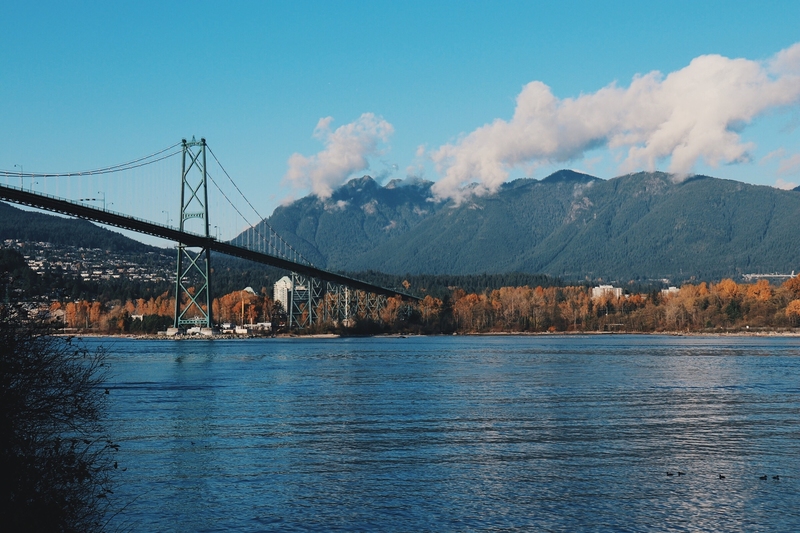 You can either take a bus and take a walk along the seawall, or rent a car and park at the Prospect Point Lookout, the iconic location for a sweeping view of North Vancouver, Lion’s Gate Bridge, and the Burrad Inlet. If you time it right, you’ll be able to see the cargo barges passing under the suspension bridge looks like an emerald version of San Francisco’s Golden Gate Bridge. Another landmark in Stanley Park is the Lost Lagoon, a lush enclave that is about a 30-minute walk around its perimeter. The lagoon is a haven for many species of birds including swans, herons, and ducks. When the sun sets on the horizon of the lagoon, it’ll make for a very picturesque end to your day. Right out a postcard – sunset at the Lost Lagoon will be cemented in your memory for years to come. If you have an afternoon to spare, make the trip to Granville Island, Vancouver’s artistic hub. We recommend skipping breakfast at your hotel and heading straight for the Public Market. If you’ve been to Melbourne’s Queen Victoria Market, Granville Island’s own marketplace is just like that but with more variety. You can shop for groceries at the produce stores and stare in wide-eyed wonder at the many species of salmon on display. If you have a sweet tooth, there is an entire row of bakeries with nutella croissants and macarons that would tempt your tastebuds, because what are calories when you’re on vacation? After you’re done stuffing yourself silly at the market, it would be just in time to see the artisans at the various workshops fire up their kilns. We had the pleasure of watching glassblower Benjamin Kikkert work his magic over at Vancouver Studio Glass. In the boutique are also the works of many other artists from all over Canada, and if you’re interested in purchasing a piece, they do ship internationally in specially-created crates. You can even arrange to learn how to work with molten glass if you have around 2-3 hours to spare, and it doesn’t matter if you’re a newbie. Tucked away towards the easternmost part of North Vancouver is a little coastal village called Deep Cove. The quaint little town is perfect for scenic hikes or walks along the pier. If the weather permits, you can even rent a paddle board or a kayak and head out to the islands across the blue water as the waters here in the cove are usually calm, despite it being a part of the ocean. If you’re up for a hike, the most popular route in Deep Cove is the trail to Quarry Rock. The hike starts in between two houses, and should take you an average about an hour to get to the clifftop. Once you’ve reached the end, you should definitely take a breather not just to catch your breath, but to soak in the amazing views of the Indian Arm. This hike is one of the most popular in the city, so don’t be surprised if it gets crowded. Our tip is to head there early on a clear day, find a free parking spot near the park, and just enjoy the journey. When you’re back in Deep Cove, reward yourself with a signature honey donut from Honey Doughnuts. If you’re reading this, you might already know about Grouse Mountain and its fancy gondola that offers you picture-perfect views that stretch all the way from downtown Vancouver to the Olympic Peninsula in Washington State. However, a little-known secret just to the west of Grouse Mountain is the Barrett’s View Lookout at Cypress Provincial Park. While there are no gondolas and fancy tourist attractions, the view here is simply beyond divine. On a clear day, you might even spot the snow-capped peak of Mount Baker in the distance. Remember to bring your cameras, but leave your selfie sticks at home. It’s a windy drive to the park that’s halfway up the mountain, and the best time to come is just before sunset, but make sure you’re there about an hour before dusk as the carpark will fill up quite fast once the golden hour approaches.